Neck Spring Trail begins at the parking area for Shafer Canyon Overlook in the Island in the Sky District of Canyonlands National Park. It's a six mile loop that descends about 300 feet into the upper portion of Taylor Canyon. Along the way the trail passes two springs, vital to wildlife in the area. 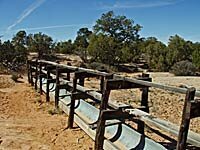 In several places there is evidence of ranching which occurred in the late 1800s and early 1900s before the land was set aside for the national park. As trails go, in the Island in the Sky, I found Neck Spring to be less spectacular than some of the others. If you're new to the canyon country, this trail is certainly a good introduction and is less strenuous than the longer trails that drop 1000 feet or more off the mesa top. I saw six other people on this hike, more than I've seen on the longer trails. Even on perfect spring and fall days, the longer trails in Island in the Sky get very little use. I don't understand why. This trail begins by crossing the park road and gradually descending below the mesa top, crossing the drainages of Neck Spring and Cabin Spring. Each has just a trickle of water. Beyond Cabin Spring the trail climbs rather steeply back to the mesa top. Approaching the top, there are nice views of upper Taylor Canyon t o the northwest and the La Sal Mountains to the east. Eventually the trail crosses the park road again and returns to the parking area above Shafer Canyon. Wonderful views of Taylor and Shafer Canyons and the La Sals from this last part of the trail make for a great finish. I really took my time on this hike, stopping for more than an hour for lunch and was still back to my car within five hours. 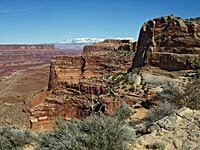 Click here to view photo galleries from some of the other trails in Canyonlands National Park.